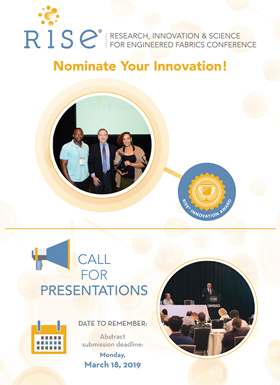 INDA is calling for presentations for RISE 2019 and nominations for its RISE Innovation Award. The Association of the Nonwoven Fabrics Industry (INDA) has announced a call for presentations for the ninth annual Research, Innovation & Science for Engineered Fabrics (RISE) Conference. RISE 2019 will take place from 24-25 September 2019 at North Carolina State University, Raleigh, North Carolina. it is a two-day conference and development event for professionals in materials’ science technology, R&D and new products. Industry professionals should submit their technical abstracts for consideration by 18 March 2019. It is an opportunity to share ground-breaking work with senior-level nonwoven/engineered materials' professionals looking for new technologies, processes, and materials. A full list of topics currently under consideration can be found here. Presentation abstracts of approximately 300 words should be emailed to Deanna Lovell, dlovell@inda.org, by 18 March and include contact information and the relationship of the research to nonwovens or engineered fabrics. Authors will be notified of the abstract’s status within 30 days after confirmed receipt. INDA is also seeking nominations for new and original nonwoven products and technologies for its RISE Innovation Award. INDA will consider categories listed on its website and products should exhibit one of more of the following characteristics: creativity, novelty of approach, uniqueness and technical sophistication. The submission deadline is 15 July 2019. Exhibition for professionals from the nonwoven and related industries. Submission details are available on the FiltCon 2019 website. The role of 3D printed spacers for organic fouling mitigation in direct contact membrane distillation was evaluated. The event attracted a large number of senior industry leaders.